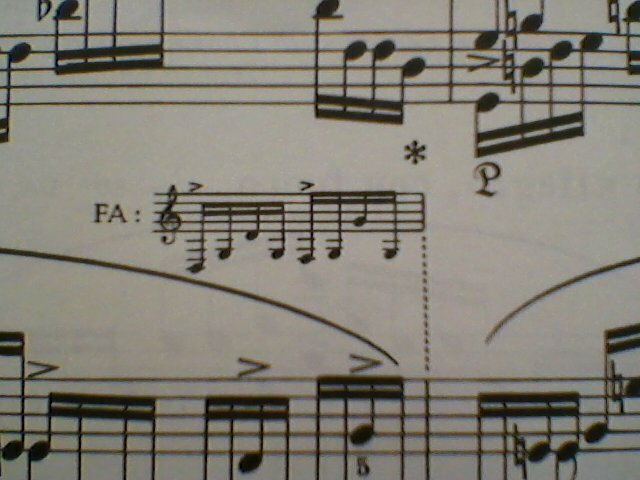 I saw this in Chopin's Op.25 No.12 etude and was bemused. On the next line, the asterisk reappears on its own. What is this called and what does it mean? There are two unrelated things going on here, and I'm not sure which you're asking about. You also reference the "asterisk" symbol. However, this goes with the staff above it, and is a pedal release marking. You can see that it is followed by a cursive "P" at the beginning of the next measure, which indicates where the sustain pedal should be depressed. It is then held until the next asterisk. What does Opt. S.D. mean? What are the little “X”'s next to the notes?